New insights into the regulation of neuroplasticity. The human body consists of almost 100 billion neurons that contain synapses, point-to-point contacts for information transfer. Every function, feeling and action depends on the ability of synapses within neurons to maintain continuous communication with each other. Synapses transmit information in the form of synaptic vesicles that contain specific chemical messengers called neurotransmitters. The continuous release of neurotransmitters is essential to maintain communication between neurons. To better understand and address a number of neurological disorders, the medical community need a better understanding of how synapses can continuously relay information between neurons. Now a new study from researchers at the Max Planck Florida Institute for Neuroscience and the Pasteur Institute have discovered that a key factor in regulating this continual communication is the proximity of synaptic vesicles next to voltage gated calcium channels within synapses. While synapses contain hundreds to thousands of synaptic vesicles, when a specific signal is received by the neuron, only a fraction of synaptic vesicles that exist in what is called the readily releasable pool are discharged from one neuron to another. Previous studies have demonstrated that within the readily releasable pool, synaptic vesicles have different specific kinetic properties of release that impact the type and bandwidth of information that can be relayed in response to stimulation. What was not known was the cellular mechanisms that regulate the release of synaptic vesicles from the readily releasable pool to support the early stages of auditory processing. The team state that a dominant factor regulating the properties of synaptic vesicle release supporting the early stages of auditory processing is the distance between the synaptic vesicles and voltage gated calcium channels within a synapse. The researchers characterized the readily releasable pool of synaptic vesicles at the calyx of Held, a critical component of auditory processing, employing several different techniques that allowed them to investigate the pre-synaptic mechanisms of informational transmittal. The current study identifies the critical mechanism is the regulation of Ca2+ influx through voltage gated calcium channels and release of neurotransmitters by synaptic vesicles. These findings are important for understanding the mechanisms of synaptic transmission, specifically for neuronal circuits that rely on fast, continuous synaptic transmission. The team state that identifying what factors are involved in proper synaptic transmission and neural circuit function have tremendous potential as therapies for neurological disorders or brain injury. The team now plan to uncover molecular mechanisms that allow synapses to sustain synaptic transmission over a wide range of activity levels to allow for proper information processing by the neuronal circuit in which they are embedded. Schematic diagram showing SVs at different priming states located at different distance to the Ca 2+ source. Only the SVs that locate close to the Ca 2+ source can be released by AP. 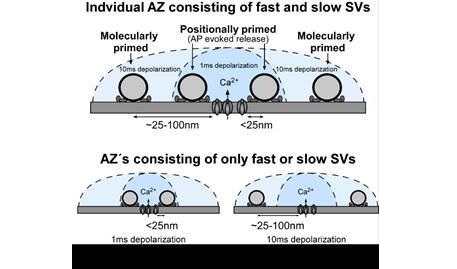 We propose that either a single AZ contains a mixture of fast and slow SVs (A) or that there are individual AZs within the calyx that contain only fast or only slow pool SVs (B). In both cases, we propose that distal SVs are rapidly converted to fast pool SVs for AP-evoked release to maintain signaling at high firing rates. Credit: Max Planck Florida Institute for Neuroscience; Dr. Samuel M. Young, Jr.